A husting for the Lewisham East by-election was shut down by abusive “anti-fascists” who shouted “UKIP scum” at the party’s candidate and disrupted his speech. Labour’s candidate in the by-election, to be held this Thursday, appeared to support cancelling the event and a senior member of the party attended the protest. Around 50 so-called “anti-fascists”, holding signs made by the radical left wing group Stand Up to Racism, attempted to block the entrance to the event at the Catford Salvation Army Hall Tuesday evening. 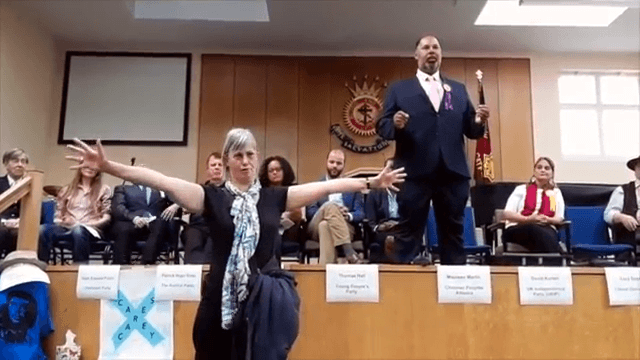 Footage supplied to Breitbart London by UKIP candidate David Kurten, a member of the London Assembly, shows the activists swearing and cursing as he entered the building with the help of police at around 7 pm. A woman claiming to be from ‘Lewisham anti-racists’ also disrupted his speech inside the event, ranting for nearly two minutes. “I always find it a little bit amusing when white people call me a racist,” Mr Kurten chuckled as the woman was finally dragged from the room and the crowd cheered. The event was completely shut down by police just 20 minutes later due to public order concerns, as the crowds outside continued to grow. “Last night’s episode when the Lewisham East by-election hustings were closed down by a far-left mob was a chilling event reminiscent of Hitler’s brownshirts who used violence and intimidation to shut down opposition parties and opponents,” Mr Kurten told Breitbart London. 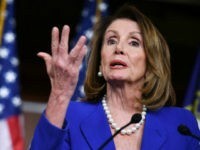 “The far-left socialists of today are acting more and more like the National Socialists of the 1930s. “There can be no doubt that freedom of speech is under attack from the far-left. It is clear that they disdain democracy and want to prevent voters from hearing candidates and making up their own minds and opinions. Last Friday, Stand Up to Racism Lewisham issued a “call to cancel” the event on their website and the Labour candidate, Janet Daby, said she would not attend and debate her opponents, labelling them “far right”. Those attending the protest outside the event included Claudia Webbe, a member of Labour’s National Executive Committee and a prominent supporter of party leader Jeremy Corbyn.